Baltic-C is a BONUS funded project and will develop and apply an integrated ecosystem model framework based on the cycling of organic carbon (Corg) and carbon dioxide (CO2) in the Baltic Sea water and drainage basin, taking into account fluxes across the atmosphere and sediment interfaces (Fig. 1). 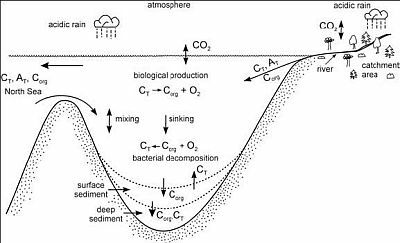 to provide the first comprehensive integrated assessment of the potential effects of climate change, eutrophication, increasing atmospheric CO2 concentration, and acidic deposition on carbon cycling in the Baltic Sea and its catchment area. Karin Wesslander received her Ph.D. degree from University of Gothenburg with her research on "The Carbon Dioxide System in the Baltic Sea Surface Waters". Abstract and Summary can be downloaded here. Prof Anders Omstedt (GU gave a talk on the occasion of the 65th birthday of Prof. Bernd Schneider (IOW): Some major achievements during BALTEX Phase II (2003-2012). Festkolloquium am 13 Mai 2001, anlässlich des 65. Geburgstags von Prof. Bernd Schneider, IOW, Warnemuende. Prof. Bernd Schneider (IOW): "The Baltic Sea CO2 system"
Baltic-C Second Scientific Study Workshop, Baltic Sea Research Institute Warnemuende, 9-10 November, 2009.